Toay, A.N. tells us about AC motors/electric motors and the causes of faults. If like him you want to discuss a topic that you like, send us a mail and we will publish it after a short review! 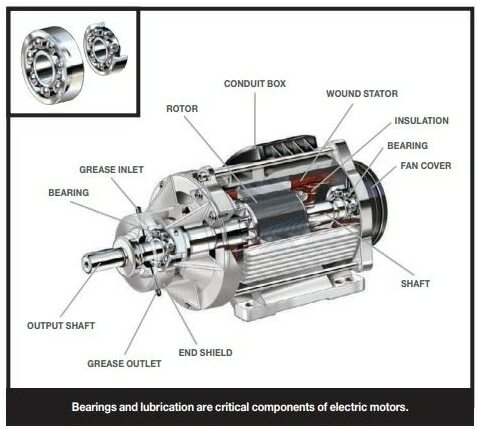 Failure in electric motors may occur at start-up or during operation. Most of the electric motor failures occur at start up due factors such as low insulation resistance, over-current or mechanical failures. Other causes include issues with the supply, operation environment or lack of maintenance. Most of the motors, regardless of type and rating have a long service life and only require a minimum maintenance to ensure they do not malfunction. It is recommended to regularly maintain the motors and associated equipment, and to check for signs of aging of the insulation or other parts that may degrade the motor. A regular inspection and maintenance will help in identifying weak areas or parts that are about to fail, and rectify them before a problem occurs. There are six main areas where faults occur due to a variety of reasons. These areas are usually referred to as fault zones and include the power circuit, power quality, stator, rotor, insulation and air gap. Low insulation resistance is one of the most common causes of motor failures and also one of the most difficult to handle. A low insulation resistance leads to leakages or short circuits in the coils and finally the motor malfunction and failure. When the insulation becomes weak, it eventually breaks down and does not provide the required isolation between the conductors or motor windings. The initial resistance of the insulation of the windings is usually very high – in the order over one thousand mega ohms ( > 1MΩ). However, after some time, the insulation starts degrading due to overheating or other undesirable conditions such as corrosion, physical damage and others conditions. To prevent such problems, the maintenance people should perform regular inspections of the insulation. 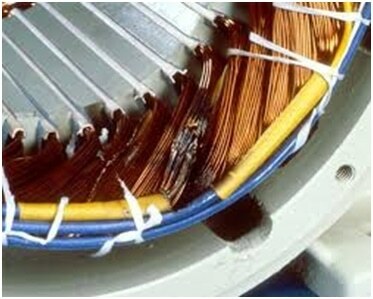 An electrical overload or over current condition occurs when excessive current flows inside the motor windings. This is usually more than the design current the motor winding can carry efficiently and safely. An over current may occur due to various reasons; in particular a low supply voltage will cause the motor to draw more current in an attempt to maintain its torque. Another reason is when there are short circuited conductors, excess voltage etc. An overcurrent condition leads to overheating of the motor and damage to the insulation. And it is possible to minimize the risk of motor failures due to over current. This can be done by using reliable over current protection, to detect any over current condition, and interrupt the supply and hence stop the current. Overheating in the motor occurs from a variety of reasons, the main one being bad power quality such as overvoltage or under voltage condition. If the supply voltage is higher that rated voltage, the excess voltage is dropped in the motor windings, resulting in to heat dissipation. On the other hand an under voltage will lead to over current condition which results into more I2R losses in the windings. An over current condition may also happen due to shorted windings or other conditions inside the motor. The other reason why overheating occurs in the motors is the overloading of the motor, or operating the in hot environments which are beyond the motor design or recommended temperature. A motor with excessive temperatures due power supply or operating environment will fail faster, especially if the rate of removing the heat away from the motor is low. Temperature will continue to increase as the heat generated remains in the motor, causing further increase in temperature and damage to the insulation. It is recommended to use ventilated areas, ventilation systems of cooling fans if the environment is likely to get hot. An overheating condition existing for a prolonged period of time regardless of the cause will lead to insulation damage and damage to the motor. Vibrations can lead to several mechanical issues inside the motor and likely to happen when the motor is installed in an unstable surface. In addition, other faults in the motor such as loose bearings, misalignments, and corrosion related issues like wear may cause the motor to have internal vibrations. This reduces the accuracy and efficiency while accelerating the tear and wear on the moving parts that are in contact with one another. The moisture can cause a lot of problems to the motor by causing corrosion of various parts of the motor. In particular, the moisture will corrode the insulation, and lead short circuit between the windings, corrode the bearings, motor shaft and rotors. This will prevent the smooth rotation, decrease efficiency and lead to complete failure of the motor. Dirt such as dust and other debris can block the flow of air in the motor cooling fans, and lead to overheating. In addition, dust particles and other small objects inside the motor may introduce some resistance that will slow down the motor, meaning that it will have to work harder to overcome this resistance. The dirt particles may also be abrasive in a way to damage the insulation. Faults in AC electric motors are caused by simple things and can be prevented through regular maintenance, observing the recommended operating conditions such as well ventilated, dust free environments with no moisture. In addition, it important to have a stable supply to the motor and the appropriate over current and over voltage protection gear. What’s your opinion on this subject? What more can you say about the causes of faults in AC motors? or copy this trackback: http://engineering.electrical-equipment.org/energy-efficiency-motors/causes-faults-electric-motors-effects.html/trackback from your own site. Solid info, thanks. Overload through mechanical issues is a sure cause. Be good to have a follow-up on motor tests, such as insulation resistance. I knew that overheating in electric motors can cause problems, but I never found out why it happens. I’ll try and make sure that the voltage levels are correct so that my motor runs properly. I’ll refer these tips to my coworker too! I am a mechanical engineer and I know this very well. These five are the major cause of electric motor failure. Good information.